Keith joined the University of Michigan Health System in 2015. With more than 20 years of experience in academic health care, he will help lead value within the organization through process, efficiency, and design to deliver high quality service and care at appropriate cost. Prior to joining UMHS, Keith held roles of Chief Operating Officer for the University of Miami Medical Group; Chief Executive Officer of the University of Southern California’s Care Medical Group; Chief Executive Officer, University Physicians, University of Mississippi Medical Center; as well as Chief Operating Officer for the Medical Group and Chief Revenue Cycle Officer for the Health System at University of North Carolina at Chapel Hill. 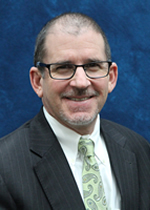 His expertise in clinical department management, large academic physician group management, revenue cycle operations, ambulatory operations, contracting systems and many other aspects of an integrated healthcare delivery system will allow him to increase value to patients, physicians, and the research and academic community. Keith has worked with various consulting firms on process improvement initiatives such as revenue cycle, throughput, patient experience, revenue enhancements and cost efficiencies. Keith received his accounting degree from the University of Texas at Dallas and his MBA from the University of North Texas and is a licensed CPA in the state of Texas.